Professor Biman Prasad ... sound credentials - for democracy and a free media. 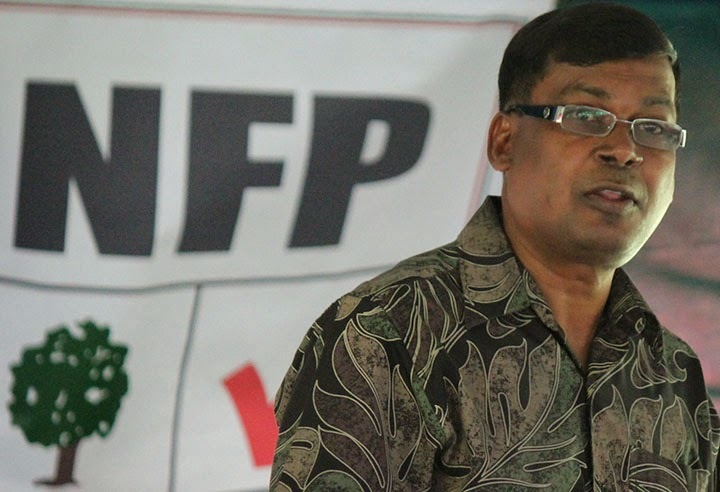 FIJI ‘new wave” political hopeful Biman Prasad, a University of the South Pacific academic and economist with some sound democratic credentials, had positive messages for the beleaguered media last weekend. In a speech to a working group of the rejuvenated National Federation Party, he handed out a few bouquets to the Fiji scribes. 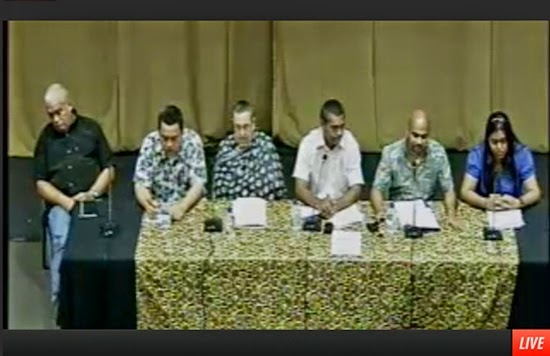 Professor Prasad was at pains to acknowledge the handicaps that journalists faced in Fiji under the Media Industry Development Decree (MIDA), saying that while this remained in force, the 2014 general election in September “cannot be free and fair – period”. And unlike many other politicians, he actually knows what he is talking about with the country’s media. In 2008, he was co-editor of a Fijian Studies academic journal with the theme “Media and democracy” in Fiji. And this followed a rare Pacific media textbook textbook Media and Development: Issues and Challenges in the Pacific Islands. In both collaborations his partner was then USP head of journalism Shailendra Singh. So his commitment to media freedom is sincere and well-argued. But after eight years under this military backed regime, it is hard to think back to the days when Fiji actually had a feisty, truly independent media, arguably the best in the region. Gagged José Belo at a Media Law Seminar in Dili hosted by the Secretary for Communication. IT WAS a stunt that arguably, in any democratic country on any given day, would have led the media headlines and stopped anyone that cared about their rights to speak freely in their tracks. But as the man who was this year included in Reporters Without Borders 100 “information heroes” list for his contribution to journalism world-wide, José Belo, sat quietly on the head table at yesterday’s Secretary of State-led media capacity workshop in Dili with a bandana fixed across his mouth, the noise was sadly minimal. 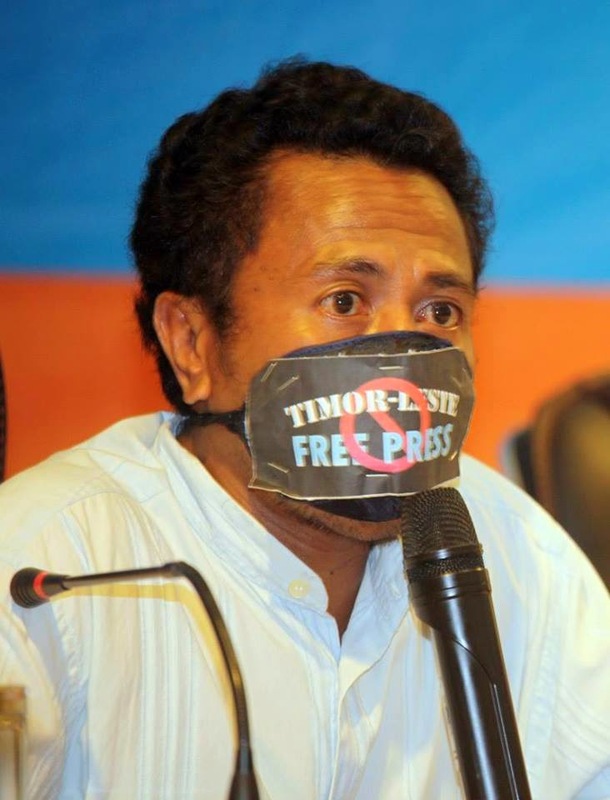 For almost an hour Belo sat, his mouth forced shut as a sign of the gag the veteran journalist believes will soon be forced on Timor-Leste’s fragile media under a new law. 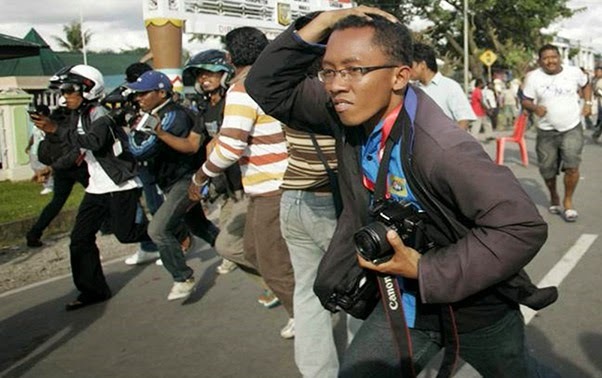 As the nation’s first new media law now sits waiting presidential approval, Belo warned that, in its current form, its restrictions on who can and can’t operate as a journalist, government control of the regulating press council body and worrying stipulations on information access would signal the death of Timorese journalists’ spirit. Sobering times, but is it too little too late to save freedom of expression and plurality of voices in a country that so many times has proudly paraded its own long fight for freedom? 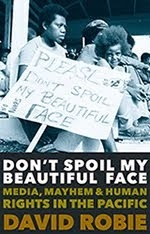 REVIEW: WHAT makes the book Don’t Spoil My Beautiful Face: Media, Mayhem and Human Rights in the Pacific really interesting is that it’s not just the reprinting of David Robie’s very good investigative pieces of reporting, but he weaves into it his autobiographical story and that gives context to his various pieces that he has gathered together. 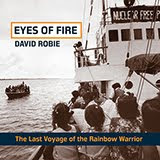 It gets rights inside the issues and shows the trust that was placed in David Robie by people who really wanted their stories told. 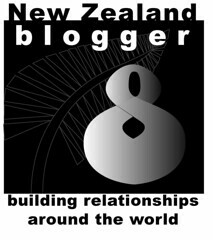 So it is well contextualised and I think it is a real contribution to Pacific journalism by collecting it all together. The final part of the book is about his role as a journalism educator, and also his perceptions of the way that journalism in the Pacific has developed. He has a very interesting model that he calls critical development journalism. It is a little bit like investigative journalism. Last year's infamous Caveman 'ko' against Marc Giroud moment for his Lyon club as captured on YouTube. SELF-STYLED caveman Sebastien Chabal retired from rugby on Sunday, the French forward bowing out with critics split over his rugby-playing abilities but no-one in doubt over his role as a "monument to marketing". The 36-year-old Chabal won 62 caps for France as a powerhouse lock and back row forward, winning two Grand Slams, and his last act of a 16-year career came when he turned out a final time for Lyon, his current club which he has helped seal promotion from the ProD2 to the Top 14. Lyon beat La Rochelle 27-26 on Sunday, Chabal coming on as a substitute to rapturous applause. Chabal was one of the best-known and best-paid rugby players in the world, his dark beard and locks catapulting him into the public eye, with a couple of notable performances on the pitch in 2007. "I adore rugby but I'm very conscious of the efforts needed to perform at the highest level," Chabal had said when announcing he would retire earlier in the week. Criminal cyber defamation, journalist killings with impunity and legal gags are growing threats to Asia-Pacific press freedoms, writes educator David Robie on World Media Freedom Day. ONE OF Fiji’s best investigative journalists and media trainers ended up as a spin doctor and henchman for wannabe dictator George Speight. Like his mentor, he is now languishing in jail for life for treason. Some newshounds in Papua New Guinea have pursued political careers thanks to their media training, but most have failed to make the cut in national politics. A leading publisher in Tonga was forced to put his newspaper on the line in a dramatic attempt to overturn a constitutional gag on the media. He won—probably hastening the pro-democracy trend in the royal fiefdom’s 2010 general election. The editor of the government-owned newspaper in Samoa runs a relentless and bitter “holier than thou” democracy campaign against the “gutless” media in Fiji that he regards as too soft on the military-backed regime. Yet the editor-in-chief of the rival independent newspaper accuses him of being a state propagandist in a nation that has been ruled by one party for three decades. In West Papua, Indonesia still imposes a ban on foreign journalists in two Melanesian provinces where human rights violations are carried out with virtual impunity. Journalists in the Philippines are also assassinated with impunity.